“Every baby deserves a healthy start in life,” according to Dr. Jennifer Howse. Healthy babies are her business. She’s president of the March of Dimes, a nonprofit organization founded in 1938 with the mission to improve the health of babies and their mothers. The organization issues an annual “report card” to each state and to the US as a nation. The report cards reveal which well-baby strategies are working and where improvement is needed. The national report card for 2012 is good news. The rate of preterm births is at its lowest point in 15 years. Only 11.5 percent of US babies were born before the 37th week in 2012. March of Dimes chief medical officer Dr. Edward McCabe says the risk of death is three times higher for babies born between 34 and 36 weeks. Babies born during the 39th and 40th weeks fare best of all. 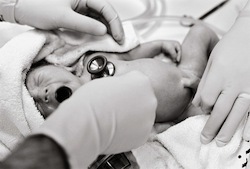 The national rate of preterm births peaked in 2006, at 12.6 percent. The rate has been dropping every year since then, a trend that leaves the organization to estimate as many as 176,000 more babies were born closer to full term during the six years between 2006 and 2012. The March of Dimes began publishing their report card grades in 2008. Their goal is to achieve a preterm birth rate of just 9.6 percent by 2020. California’s grade is being hailed as a notable achievement. The state earned its first “A” grade. The state’s size and diversity in population makes earning an “A” a remarkable achievement, according to McCabe. One strategy that’s working in California is the reduction in elective early deliveries before 39 weeks. Recent studies indicate the last couple of weeks of gestation are critical for developing robust respiratory and digestive systems. Individual states such as California are earning higher scores but the overall national score is still troubling, according to the organization. It gave the United States a “C” because the nation as a whole still has more preterm births than many of the world’s industrialized nations. Howse says, “we must continue to invest in premature birth prevention” so every baby can have the healthiest start possible. Source: Premature Birth Report Card. March of Dimes. 2013. Web. Retrieved 12 Nov 2013.